Apple's new Lightning dock connector for the iPhone 5 will reportedly allow for new types of accessories, as the updated port supports the ability to host USB devices. According to Japanese blog Macotakara, the ability of Lightning to host USB devices will allow third-party accessory makers to create new kinds of products that were not previously possible with the legacy 30-pin connector. 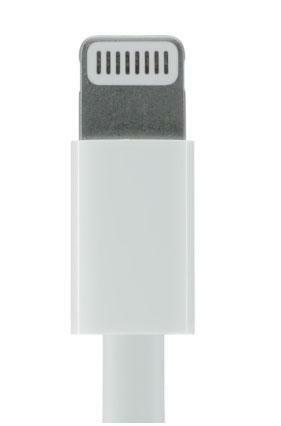 Apple's new iPhone 5, iPod touch and iPod nano all feature the smaller Lightning dock connector. Previously, only the iPad had the ability to host USB devices through Apple's Camera Connection Kit. The Apple-made, accessory USB port allows users to connect devices such as cameras and wired keyboards to their iPad, but not the iPhone. But with the switch to Lightning, Apple will reportedly offer built-in support for USB hosting. That means accessories like cameras, keyboards and other devices could potentially be connectable to the iPhone with third-party accessories. Apple's new Lightning cable and port are 80 percent smaller than the previous 30-pin iOS device connector that had been around for 9 years. The new cable is also orientation independent, allowing it to be plugged into a device from either side. The new dock connector helped allow Apple to make the new iPhone 5 the thinnest smartphone on the market. Apple said Lightning ports will be quickly supported by a number of third-party accessory makers, including Bose, JBL and B&W.